Christmas lights in the Old Town. This is Rue Longue, the oldest street in Menton. Lumières de Noël dans la vieille ville. Il s'agit de la Rue Longue, la plus ancienne rue de Menton. Thank you for showing my street, Jilly. It brings back wonderful memories. 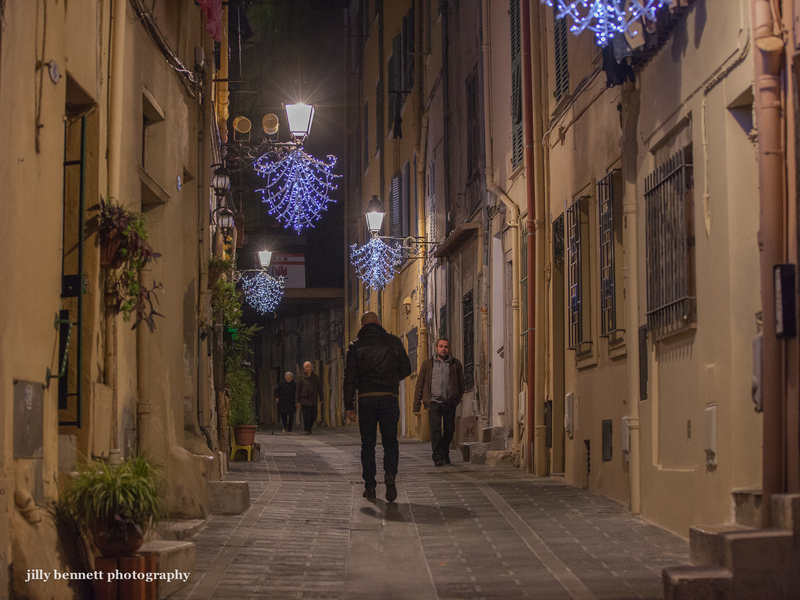 I loved the Christmas season in Menton. I will never get over those smooth paving stones on the rue Longue though. I am sure it is easier for people to get around but it was kind of exciting jumping in doorways when a car came down the street! I can't put my finger on why this photo grabbed me. Maybe it is the drab colors with people as accents. Maybe it is that you captured an ordinary moment with ordinary people going ordinary places. Of course, we have no such streets, even our (comparatively) older cities like Boston and Philadelphia. The night seems safe and pleasant there. This is a beautiful photo. Thanks for sharing. Awww, this is beautiful... elegant and simple.